As people get older they are increasingly likely to experience some form of sensory loss. Around 40% of people over the age of 60 will experience either hearing loss or sight loss with 10% of the population experiencing a degree of both hearing and sight loss. Nearly twice as many women are affected by age-related macular degeneration, the most common form of vision impairment, than men. 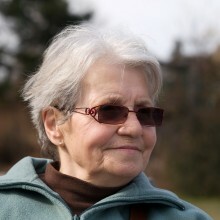 Once people reach the age of 80+ progressive hearing and/or sight difficulties makes it hard for them to maintain links with their community as they are unable to hear what people are saying, especially in group settings, or are unable to identify people or navigate community spaces, resulting in a sense of isolation. People who experience age-related sensory loss frequently report feelings of anxiety, self-doubt, and a sense of helplessness, bereavement and anger, with rates of depressions at least twice as high than in the general population. At Blue Sky Enabling staff are trained as sighted guides and to use total communication techniques so that we can enable people with sensory loss to access and maintain contact with their community.